This was a piracy of Hugh J. Johnston's and F. B. Sterling's book Modern Card Miracles . A treatise on card systems and setups, as well as effects that will fool laymen and magicians alike! Presentation, secrets, routine and patter are all included. Because most of the effects rely on subtlety instead of difficult sleights, even amateur performers can now fool with professional-caliber presentations. Included are card miracles for parlor, platform, club and stage, as well as effects that will garner free publicity if performed for newspaper editors and reporters. While advertisements say that no sleight of hand is required, one simple sleight is recommended and is explained in the ebook. Learn the inside secrets of professionals, including some excellent false shuffles and cuts and mental effects. Plus, the digital edition includes important corrections not included in the original, limited edition print book, that now bring the effects into the miracle class! 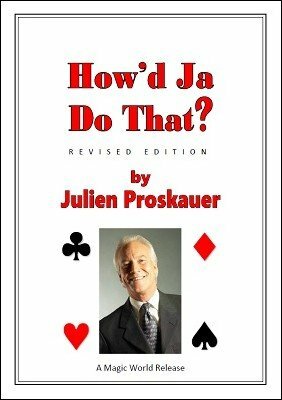 Chapters include: Introduction; Preface; Psychology in Magic; Arranging the Deck, plus an Essential Sleight; False Shuffles and Cuts; Deck Switches, Card Locations and Rapid Counting; Mental and "Spirit" Effects; Two-Person Mindreading (But Done by One Person Instead); Gambling Demonstrations and the $10,000 Challenge; Additional Effects from Some of Magic's Most Learned Authors and Performers; About the Author; Supplement. "Take a pack of cards and Proskauer's book and you can wow them." - W. J. Hilliard, "The Billboard"
1st edition 1936, 99 pages.